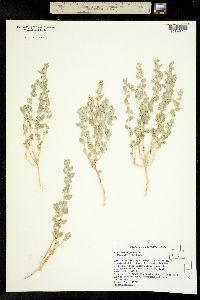 Herbs, simple or freely branched, 0.5-6 dm; branches rather stout, angled, scurfy when young. 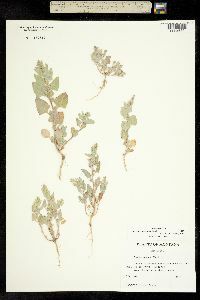 Leaves often opposite proximally, petiolate or distal bracteate ones subsessile, blade lance-ovate, lanceolate, deltoid, or cordate, 5-75 × 4-50(-75) mm, base subhastate or obtuse to acute, margin entire or essentially so, sometimes closely repand-dentate, apex obtuse to acute or rounded, scurfy (glabrous). 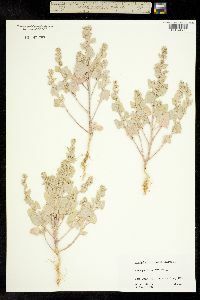 Flowers in axillary glomerules and terminal, interrupted spikes. 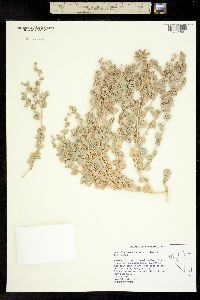 Staminate flowers borne in distal axils, or in short dense spikes or panicles, or intermixed with pistillate, with 4-5-parted calyx. 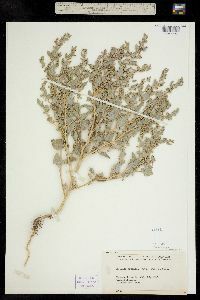 Fruiting bracteoles sessile, subsessile, or stipitate (stipe 0.5-5 mm), cuneate-orbicular, (2.5-)4-11.2 × 2-8.8 (-14 ) mm, margin foliaceous below apex, subentire or dentate to laciniate, face smooth, tuberculate, or crested, processes sometimes again toothed, teeth then aligned with axis of process. 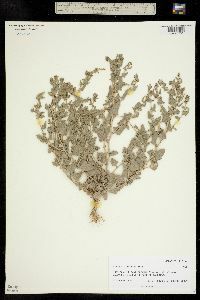 Seeds brown, 1.5-2 mm wide; radicle superior or lateral. 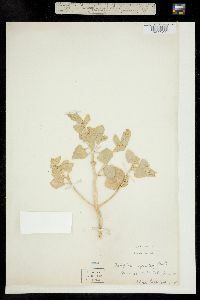 2n = 18, 36, 54. 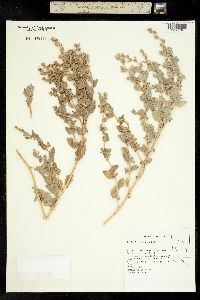 Herbarium materials have tended to represent a catchall for annual specimens not readily assignable to other taxa. 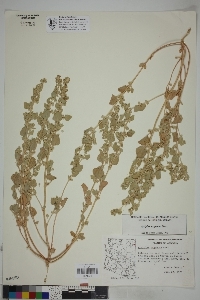 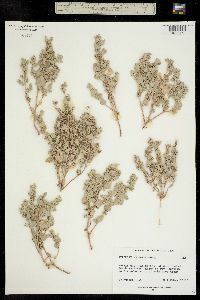 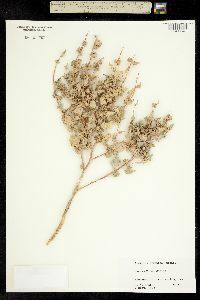 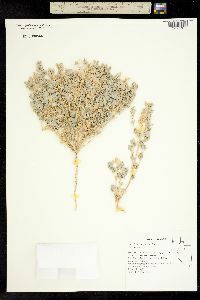 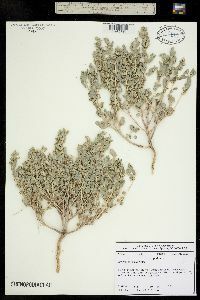 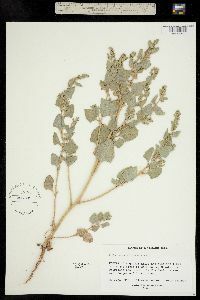 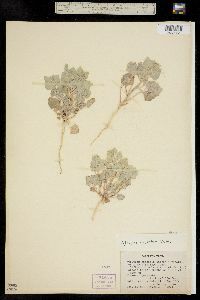 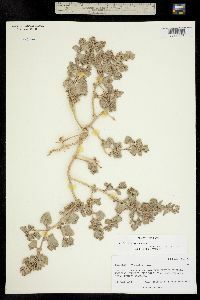 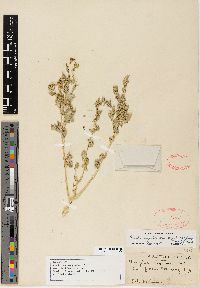 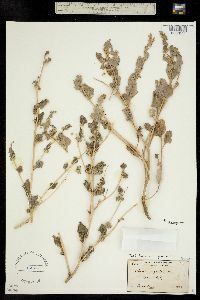 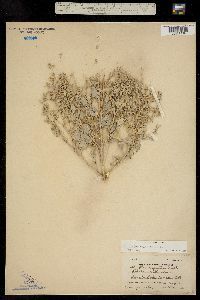 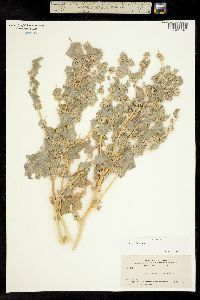 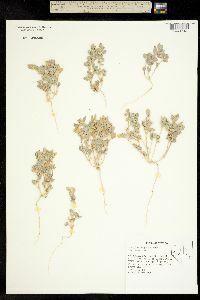 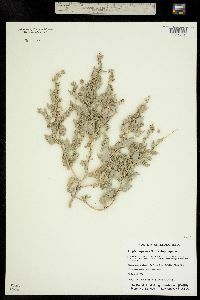 Indeed, the distinguishing features of the Atriplex argentea complex are shared singly and often in combination with other taxa. 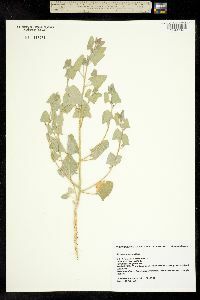 Only by use of combinations of features can this taxon be defined. 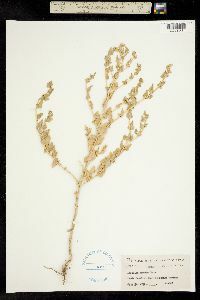 Those features, with much variation, center around the broad, typically ovate to deltoid leaf blades (often definitely 3-veined) and more-or-less compressed, sessile to subsessile (or short stipitate), fruiting bracteoles on which the marginal processes, or teeth, are mainly aligned with the plane compression, and with the faces quite smooth to variously appendaged. 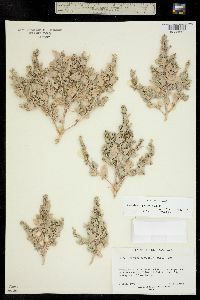 Still some specimens are apparently intermediate with other species, especially with the closely allied A. saccaria, with which it is at least partially sympatric. 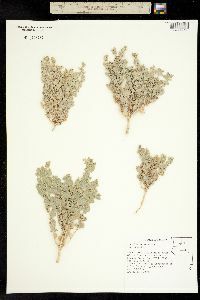 Much-branched herb to 8 dm, silvery-scurfy throughout; lvs lanceolate to ovate or deltoid, 1-3 cm, often as wide, fls axillary and in terminal spikes, the staminate and pistillate mingled or separate; fruiting bracteoles cuneate-rotund, 4-7 mm long and wide, united to beyond the middle, irregularly toothed across the broadly rounded summit, the central part indurate, the tubercles few or none, to 2 mm; radicle superior; 2n=36. 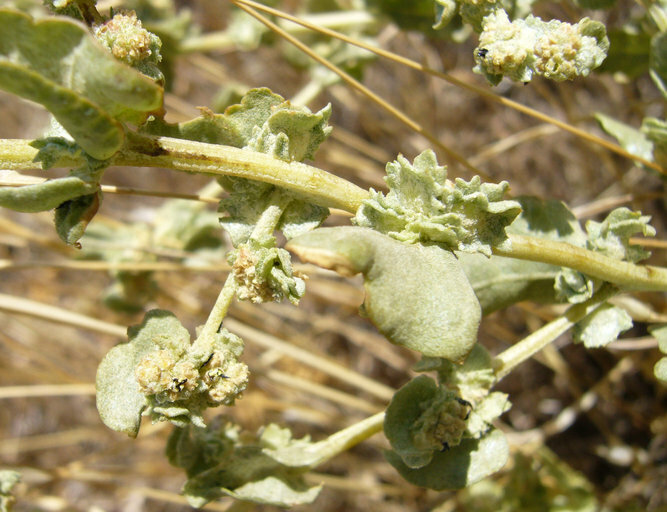 Widespread in dry or alkaline soils in w. U.S. and adj. 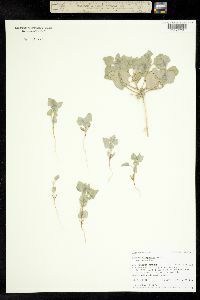 Can., occasionally intr. 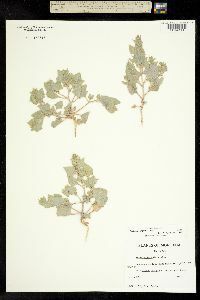 e. to Mich., Mo., and reputedly O.